VANCOUVER, BC – Following the tapping of several preview kegs at the brewery tasting room, as well as a special cask at this past weekend’s Cask Days in Toronto, the latest seasonal brew from Parallel 49 Brewing will be officially released later this week. A case of the winter warm and fuzzies requires two things: a sweater than only a grandma could love and this sweet, creamy, dark milk stout. 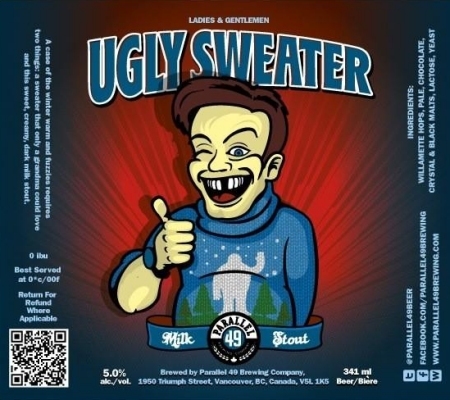 Ugly Sweater will available in bottles and and on draught starting November 2nd.